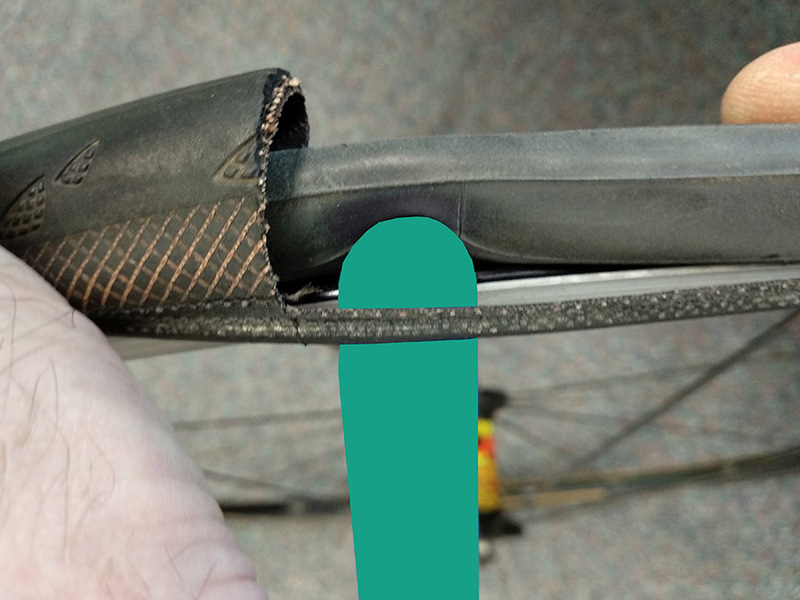 A perfect example (courtesy of TyreKey) that demonstrates how a tyre lever can cause a pinch-puncture when being used to leverage a tyre on to the rim. Traditional tyre levers should only be used to get the tyre off the rim. The TyreKey is a multi purpose tool that can be used to get the tyre off the rim and can also be used to leverage the tyre back on to the rim, without risking a pinch puncture. You can see the TyreKey does not make contact with the inner tube during the tyre fitting process. We’re very pleased to announce that we are now stockists of TyreKey, a handy, affordable and portable tool that helps road riders get tight tyres back on to the rim, following a puncture or the installation of a new tyre. TyreKey is a patent pending product designed by a former colleague of ours, Richard Jones, and his dad. Living in North Yorkshire, Richard is a bike mechanic himself and a competitive road racer. Suffice it to say, he spends enough time trying to get tight road tyres on to rims, and he gets plenty of requests from customers for hints and tips to make the job easier, especially when trying to fit a tyre on a cold day! And so, the TyreKey was born, or rather formed! It’s designers wanted to keep manufacturing close to home, so the TyreKey is manufactured here in the UK! Since it’s arrival into the tyre tool market it has been incredibly popular with riders with many people hailing it as one of the most useful bike tools that they have ever purchased. It made sense for us to stock TyreKey and to supply riders here in the Midlands with a great tool. We have one in our workshop and we have plenty for sale! You can also buy online from our web store! In the past, people have attempted to use tyre levers to leverage the tyre back on tot he rim. The problem with this method, as images from the TyreKey website demonstrate, is that the levers can pinch the tube underneath, causing a pinch puncture and adding further frustration to the situation! Not to mention that using metal levers in this manner can also damage the rim! Rich has taken the time to demonstrate the TyreKey perfectly with some YouTube videos. It’s also well worth following the TyreKey Instagram account and TyreKey Facebook page to stay up to date with the latest product development, news and store availability! Uploaded by Tyre Key on 2017-12-04. The TyreKey is currently designed for use on road tyres only. It can be used during tubeless setups and on carbon rims. The TyreKey weighs just 20g! They tyre sizes covered by the current TyreKey tool are 700 x 18 - 35c. There is demand for a MTB version of the TyreKey and we understand that there is a MTB version in development so watch this space! <————- It’s also shop dog approved! Priced at just £8.99 this is a must have essential in your tool roll or saddle bag! And if you’re not sure what to buy for the cyclist in your life in Christmas then this is a great little gift!